Art Shows have taken on a whole new meaning for me since I started working my art passion as an art career 18 months ago. Pre art career, when I was just a Mum who dabbled in paint, I would rock up to exhibitions and dream of having an artwork on display, sip my champagne, hob nob with whoever was there to hob nob with, have another champagne, peruse the art works, dream of filling my walls with a selection of chosen paintings, then go home, sad that I wasn’t ready to hang in an exhibition. 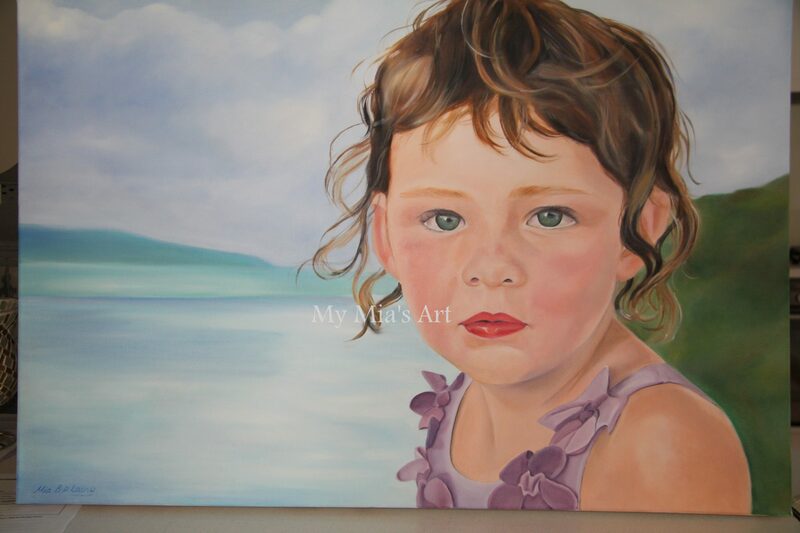 That all changed in October 2011 when I finally summoned up the courage to submit a painting to the Perth Royal Agricultural Show…I was so proud of my painting and was naively holding that glimmer of hope that it was a winner. Boy Oh Boy, was I ever wrong…there were hundreds of amazing paintings and such a high level of talent , that my beloved painting just looked, well, simple and sweet, but not an award winner, or sellable. Mind you, this is still my all time favourite painting as it was the first painting of my ‘career’. That brave step of entering my first exhibition opened up a whole new world for me…the world of ‘exhibiting artist’. I’ve been involved now, as an exhibiting artist, in a miniscule, 6 art shows and had a win in two of them. A very small number, I know, but I’m so happy to finally be regularly exhibiting and pre-planning what I will eventually submit to the various shows. 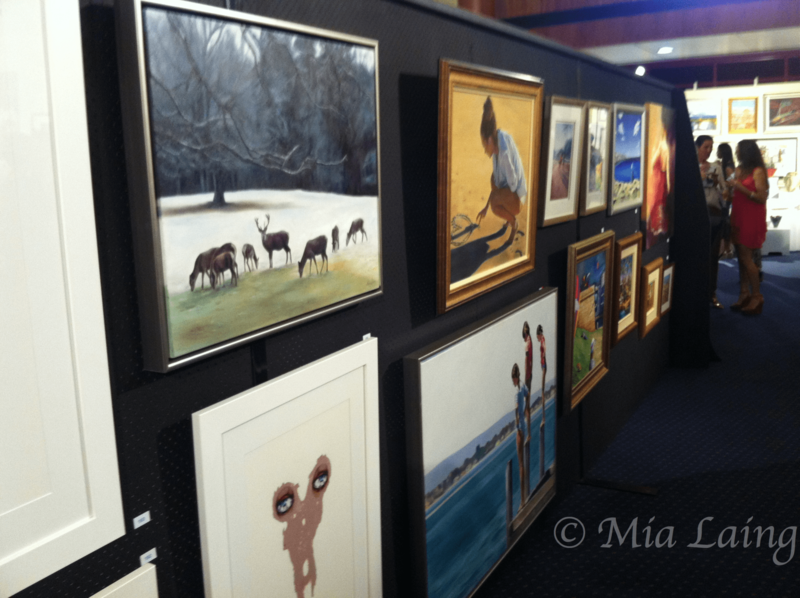 This weekend was the Newman Art Expo, a well-respected and prestigious art show that has run annually for over 30 years and is organised by Newman College, a leading co-educational school in Perth. I received a letter late last year, inviting me to exhibit in this show…Wow!! An invite! For my work…I was super happy to submit 3 paintings, yes sirree! Art exhibitions, when you have works on display, are a totally different game, then when you are there as a patron and just get to sip the ol’ bubbly and chitter chatter about genre, tonal distance and abstraction. Exhibitions, with my work in them, fill me with dread… A little part of me feels like it’s also hanging on display. It’s very confronting for an introvert. Given the feelings I have had at past exhibitions, I wasn’t even planning to go to the opening night of this one. I had planned to just slip in sometime over the weekend and have a sticky-beak. Surprisingly, Dudie wanted to go, as some friends were going to be there, so I obliged…nervously. Well, can I tell you, the first thing that hit me as I walked in was….OH MY GOODNESS…there was so much divine artwork!! Hundreds and hundreds of pieces. It was totally overwhelming. Perth, your artists are incredibly talented…incredibly! There were landscapes, and abstract, contemporary and collage, pastels, watercolours, oil, prints. EVERYTHING! Dudie I and didn’t quite know where to start looking, so we grabbed a drink and started at the main door, keeping an eye out for my pieces. We didn’t need to go far….I had the best positioning I have ever had in an art show…slap bang in the middle of the room as you walked in the main doors…my three paintings…and that little piece of my soul dangling beside them!! AND GUESS WHAT?? There it was, ‘Look Before You Leap’ with one of those gorgeous, tiny little red stickers beside it….A RED DOT, a SOLD sticker!! Oh My!! How did this happen? Especially since the show had only been officially opened for 20 minutes! As we stood there and I re-gathered my wits about me…and sipped gulped another champagne down, and grinned like a Cheshire cat…ANOTHER little red dot was placed next to ‘Beach Love’….WHAT THE!! Two sold stickers. Catch me. Me, of so little faith in my own abilities, hadn’t even considered that even one of my paintings would sell, let alone two! I was floored. As it turned out, I actually got introduced to the new owners of ‘Beach Love’…Newman College bought it for their collection. They chose ‘Beach Love’ for the positive body image it portrayed for their year 11 and 12 female students. That little snippet of information was like gold to me…the fact that how I am painting and what I am painting is touching hearts. That my goal to always paint light and life and joy in simple things is being noticed by other people. 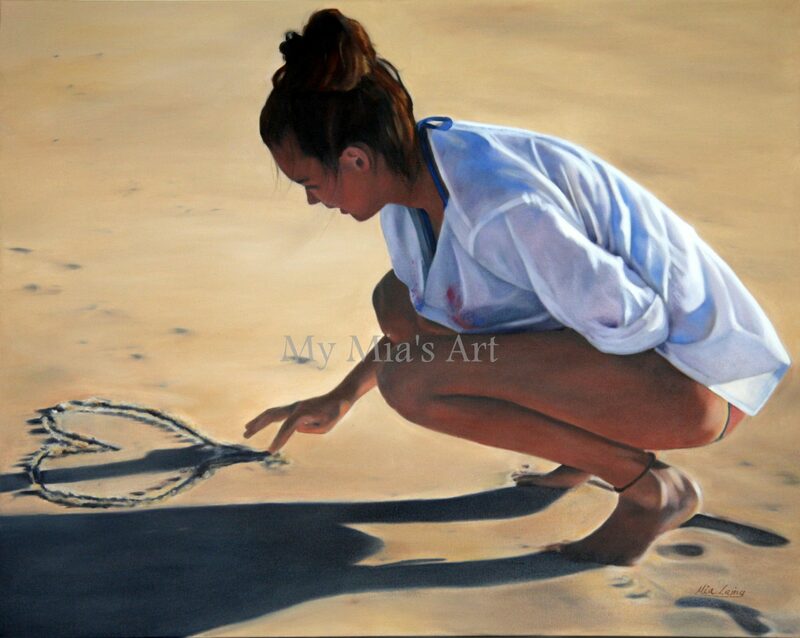 It’s my year 11 girl in the painting, covered up, proud of her femininity but not flaunting her body, strong in who she is, loving time at the beach with her family and enjoying the simple pleasure of being a kid drawing in the sand to mark a beautiful day. A moment in time, captured forever, in oil on canvas. These two sales, have given me a much-needed pat on the back and guide as to how I am going and that I’m on the right path. It’s very reassuring, as I find a lot of anguish goes into deciding what to paint. Paint to sell? Or paint what I love? Is it too personal? Would anyone want that on their wall, or is it just my family that will like it? The selling of these two paintings, especially of ‘Beach Love’, reiterated that I must paint what I love…that any painting, no matter what subject, if it is painted to the best of my ability, will speak to someone else too…and if it dosent speak to anyone else…well, it will still be treasured by my two girls…who will need to buy very big houses one day, with lots of walls, to hang all the paintings they will be given when they fly the nest!!! 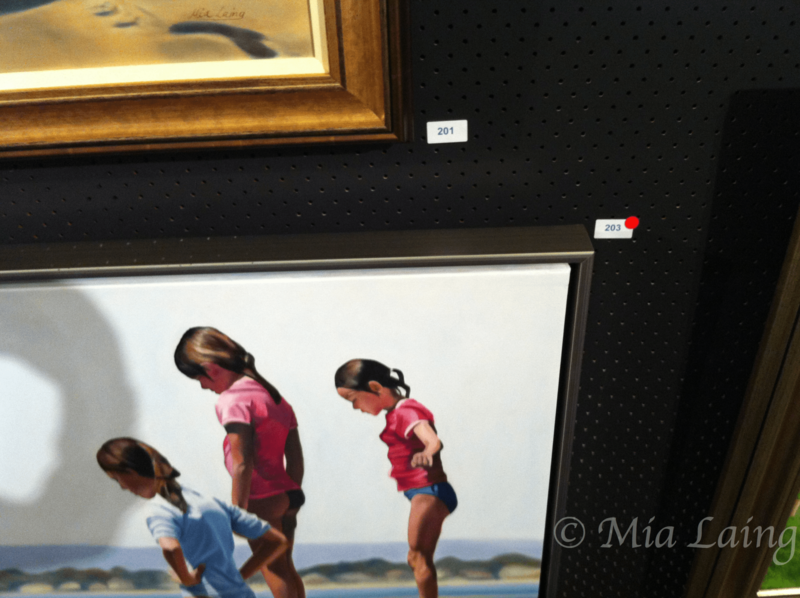 The red dot – the best thing to see in any art show! Congratulations! Thankyou! It’s amazing the power in a small red dot!! Tricia, I could almost see you smile across the miles! 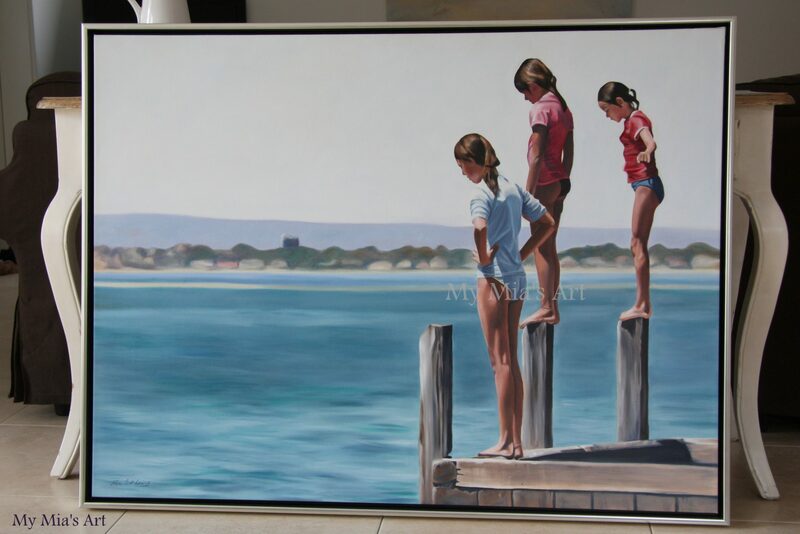 Thinking dunsborough is the best place for us to holiday in the hunt for gallery representation!! I love each and everyone of them, and watching them become finished, amazing works of art through facebook makes me appreciate them even more…. Fantastic Mia, congratulations on the sale’s. Nicole, thank you so very much…it’s lovely having a small crowd cheering from the sidelines!! So excited and happy for you! I know artists have it very tough these days so it must have been so thrilling to not only be exhibiting your work but also to have them sold. You’re right in that painting what you love will most likely touch other people because it’s sincere and from the heart. Congratulations on all these wonderful achievements! Lillian, thank you once again for your kind comment…it is a very tough industry, but I can’t not do it! Madness at times, and joy at others. Hoping this is just the start! Yay!! I was so excited reading along with this. Excited but not surprised because oh my goodness those are beautiful paintings lady! So much you said are things that I’m actively (more actively than usual) trying to figure out right now, and resonated strongly with me, especially about what to paint and who to paint it for! Thank you so much for sharing your thoughts, really helps, and I’m so pleased for you!!!!! I loved reading about your nervousness and everything too. Keeping it real! Thanks Jennifer…keep on plugging away. It’s so easy to lose direction and faith and to beat up ourselves on this artistic journey we have chosen. I sometimes struggle daily with disbelief. Selling two paintings, was magic and has helped so much with the ol self talk!! You can do it!!!! Thanks. I’m going to concentrate a bit more on having fun with it for a while!